HBO’s premium content finally became available in April without requiring customers to have a cable or satellite TV subscription, thanks to the launch of the standalone streaming service HBO NOW. For the first time since its debut, app store analytics firm App Annie has analyzed the performance of the new application in terms of its ability to attract paying customers who are willing to subscribe to HBO’s over-the-top option. Initially, HBO NOW was an Apple exclusive – the company first introduced its app and accompanying web service to those who have an Apple TV, or other iOS devices, including iPhone and iPad. Cablevision then became the first pay TV provider to sell HBO NOW access to its broadband customers, and streaming cable TV service Sling TV made HBO programming (though not the actual HBO NOW standalone app) available to its customers as well. More recently, Google announced that HBO NOW would arrive on Google Play with support for Chromecast, but that has yet to come to pass due to Apple’s three-month exclusivity window. In other words, for the time being, the best insight into HBO NOW’s traction comes from looking into its iTunes App Store rankings. Although App Annie isn’t tracking HBO NOW usage on Apple TV, it seems likely that there’s some crossover between the various platforms – it wouldn’t be surprising if a good-sized portion of Apple TV users have installed the app on the iOS devices they own, as well. HBO is charging $14.99 per month for the service, which provides access to HBO original programming and movies – content that before was only available to those who subscribed to HBO through their pay TV provider, or, in the case of some past shows, was available for streaming on Amazon Prime Instant Video. At launch, HBO NOW offered a free month of access before users had to sign up and pay. According to App Annie, that strategy turned out to be a success. The month after its launch, HBO NOW debuted at No. 1 on its Worldwide May iOS revenue charts. It also became the No. 2 Overall daily grossing ranked app in the U.S. on May 7. The similarity in the trends between May and June’s store stats doesn’t guarantee that HBO NOW will again reach No. 1 for the June index, but it definitely casts doubt on the idea that there’s been any sort of huge drop-off as the buzz of the app’s debut begins to wear off. However, HBO NOW’s traction isn’t only indicative of consumers’ interest in “Game of Thrones” and the other popular programming it offers, but instead is a bullet point in a larger trend around cord cutting. In May, for example, Hulu’s app also scored a No. 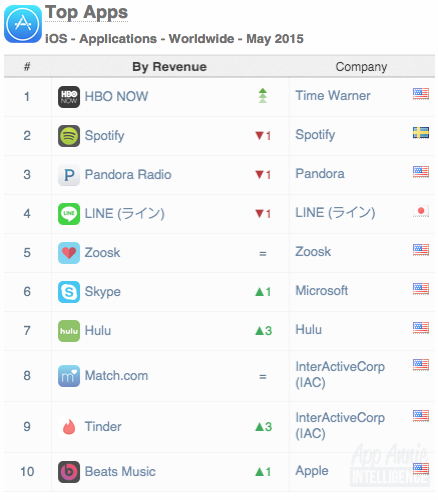 7 position on the Worldwide iOS revenue chart (Hulu offers a paid tier, remember), says App Annie. And the month before, Hulu was No. 10 on the Worldwide iOS revenue chart. This points to an increasing consumer appetite for subscription-based streaming video services. One thing that marks HBO NOW’s launch as unique – and possibly also contributed to its rapid climb up the top grossing apps and revenue charts, it’s worth noting – is that HBO NOW has offered the ability to sign up for the service and pay for a subscription via in-app purchase from day one. Other major streaming services only allowed users to sign up for the paid subscription over the web at launch, then sometime later moved to allow new users to subscribe from the app itself.